After learning about Henri Matisse and his paper cutouts, the children use his style to cut and arrange shapes while making collages. For all ages. Plan 2 to 3 sessions. 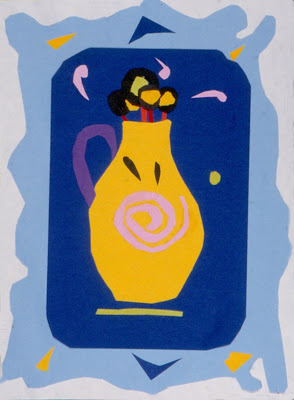 This website explores more about Matisse and has images of his paper cutouts that can be downloaded. Wall calendars of Matisse's work often have examples of his cutouts to share with the children. Henri Matisse is considered one of the most important colorist of the twentieth century. Although mostly known for his paintings, his use of color is especially apparent in the paper cutouts he made late in his life. Matisse was born in 1869 in an industrial region of northern France. His father was a successful grain merchant, and his mother, talented in art, painted china. As a young student, Matisse showed no special interest in art. At eighteen, he was sent by his father to study law in Paris. He passed the exams with little enthusiasm and returned home to take a position as a law clerk. He found the job to be even more boring than studying law. Three years later, Matisse became very ill and spent a long period of time in a hospital recuperating. His mother gave him a paint box to pass the time. He began painting and soon recognized that he was meant to be an artist. Returning to Paris to study painting, he was considered an exceptional student. He became an important painter who continually experimented with rich, bright colors and flattened, abstract shapes. At seventy-two, Matisse again became ill. Bedridden, he developed the idea of substituting cut paper for paint. He guided an assistant as she mixed colors of paint and applied them to large sheets of paper. Matisse cut directly into these painted papers, creating large naturalistic shapes. He referred to this process as “drawing with scissors.” Working with cut paper allowed him to move shapes around and achieve the precise balance and effect he strove for in his paintings. Matisse died on November 3, 1954, in Nice, France. Become familiar with the life and cutouts of Henri Matisse. Gather examples of Matisse’s cutouts. Set out 9- by 12-inch papers, planning one for each child. Set out scissors and construction paper to be cut. Display as many examples of Matisse’s cutouts as possible. As the children look closely, tell them about his life and his paper cutouts. Explain that in this session they will be learning to cut and arrange paper as Matisse did to make collages. Explain that Matisse cut directly into the paper, using his scissors as a pencil. He referred to this process as "drawing with scissors." 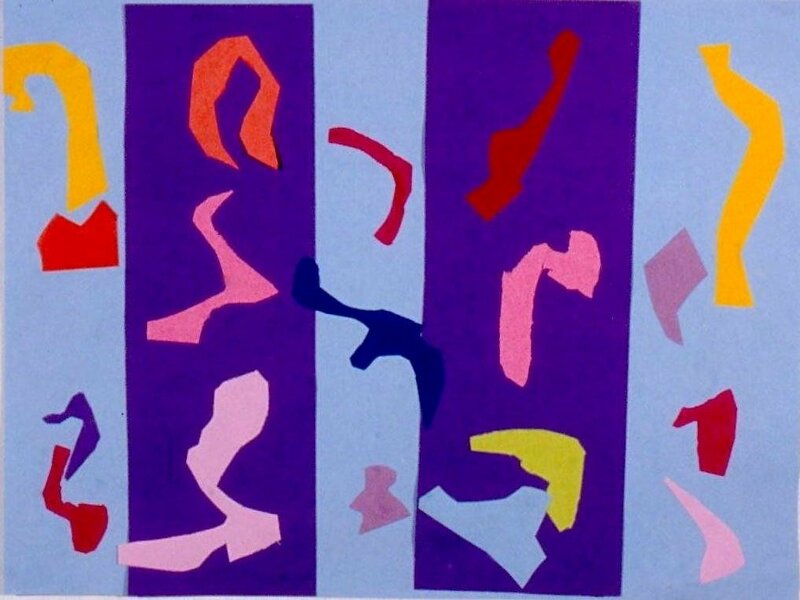 Demonstrate some of the cuts that Matisse made, such as spirals, zigzags, and curves. The cut out shapes are called positive shapes and the holes left in the paper are called negative shapes. Matisse included both positive and negative shapes in his collages. Along with a theme or unifying idea in each of his cutouts, Matisse used a simple palette of only two or three colors, including shades (black added) or tints (white added) of these colors. Have the children plan the colors and themes for their collages. As the children choose the color for their background paper, remind them that these papers are not for cutting. 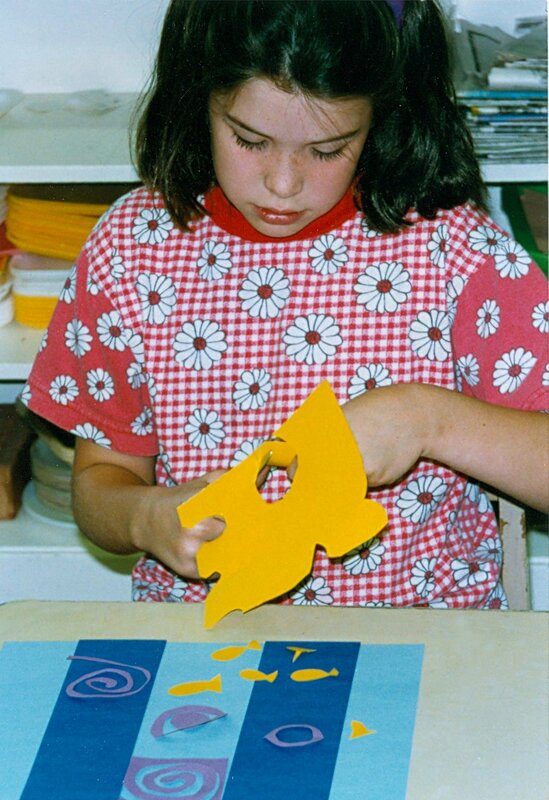 To make their shapes, they should choose from the paper designated for cutting. Have the children use their scissors to cut directly into the paper, just as Matisse did. Encourage them to save their negative shapes along with their positive shapes. Set out glue sticks and slightly dampened sponges. Set out the work from the previous session. Explain that in this session the children will be arranging their shapes on the background papers before gluing them in place. Show the children how to overlap shapes while keeping the more interesting parts visible. Point out that Matisse often placed smaller shapes on larger shapes, sometimes building three to four layers in areas. Have the children arrange their cut shapes on their background papers. Glue sticks should be made available only after all cutting and planning have been completed. Be sure the children understand that the glue should be applied to the back of the cut pieces instead of on the background paper. Not much glue is needed to attach the cut pieces and sticky fingers can be wiped on the dampened sponges. When all gluing is finished, have the children give titles to their work. To further experience Matisse’s process, older children enjoy mixing colors with tempera paint and then painting papers to be shared for cutting along with the construction paper. 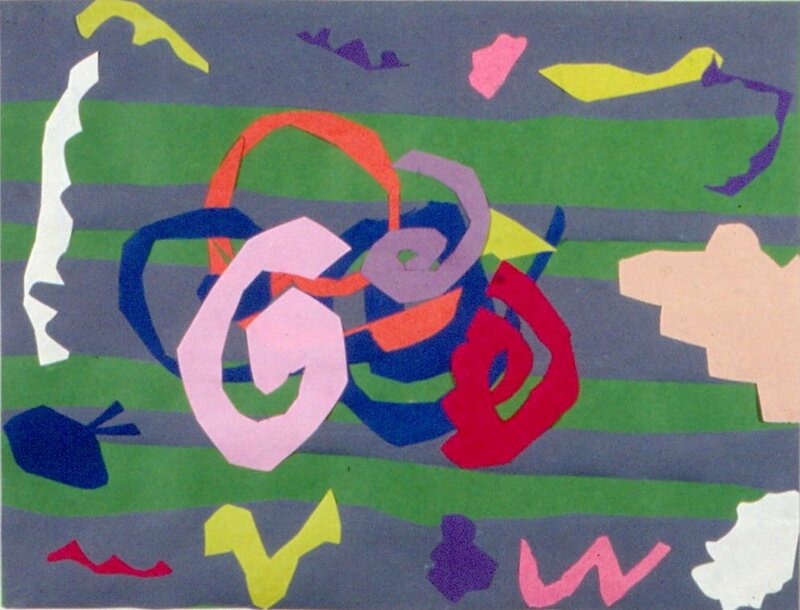 The children should use their own ideas for their collages while learning from Matisse’s use of scissors, positive and negative shapes, and limited color schemes. Do not use stencils, precut shapes, or pencils. It’s fun to draw directly into the paper with scissors as Matisse did. It's important to make the glue available only after all cutting and decisions are made. Discuss the use of color, as well as any shades or tints. Find examples of overlapped shapes. Match positive shapes with their negative shapes. Do the titles help us to better understand the collages? Uh-oh! I cut my background paper. I cut a shape. I need the glue to attach it. I cut three shapes. I’m ready for my glue. I’m afraid I’ll lose all my little pieces. My theme was going to be trees and leaves, but these shapes I cut remind me of birds. I have glue all over my fingers and my paper. If you accidentally cut your background paper, cut some shapes from another color and glue them to hold your paper together. This should make an interesting background for your collage. If you glue each shape as you cut it, you won’t be able to move the shapes around and arrange them as Matisse did. When you have completed cutting all your shapes and decided where you want to place them on your paper, we will use the glue. Carefully place your background paper and all your cut pieces in the folder with your name. I will store them for you until the next session. If you cut a shape which gives you a new idea, you can change your theme. Remember to apply the glue to the back of your cut shapes rather then on your background paper. You don’t need much glue to hold the shapes in place. If your hands are sticky, wipe them on the dampened sponge on your table.